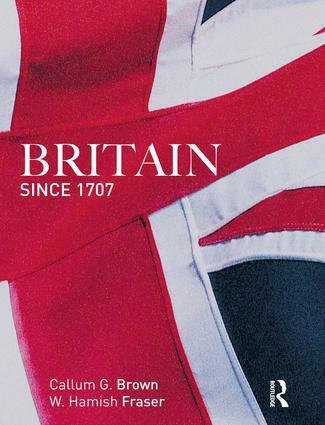 Britain since 1707 is the first single-volume book to cover the complex and multi-layered history of Great Britain from its inception until 2007. Bringing together political, economic, social and cultural history, the book offers a reliable and balanced account of the nation over a 300 year period. It looks at major developments – such as the Enlightenment, the growth of democracy and gender change – while also tracing the distinctive experience of different, the book’s additional features include: social and ethnic groups through the decades. Fully integrating Scotland, Wales and the Irish experience, the book’s comprehensive sweep includes coverage of the industrial revolution, the British Empire, the two world wars and today’s multicultural society. From Queen Anne to Gordon Brown, this wide-ranging and accessible book provides a complete and up-to-date history of Britain. Offering a coherent account of the evolution of the nation and its people, it will be essential reading for all students of British history. Preface. Part 1: Introduction. Ch 1 Approaches to Britain’s history. Part 2: An Uncertain Stability, 1707-1779. Ch 2. The political system. Ch 3. Power and society in rural Britain. Ch 4. Urban Life. Ch 5. The Enlightenment and Gender. Ch 6. The British abroad. Part 3: The Industrialising Nation 1780-1829. Ch 7. The Industrial Revolution. Ch 8. The social revolution. Ch 9. Running the state. Ch 10. Britain at war. Ch. 11. Challenges to the political system. Part 4. The Dominant Nation 1830-1879. Ch. 12. The making of an urban society. Ch 13. The Victorian economy. Ch 14. Class, gender and religion. Ch 15. Responses to industrial change. Ch 16. Politics in transition. Ch 17. The growth of the state. Ch 18. Democratic pressures. Part 5: The Imperial Heyday 1880 - 1918. Ch 19. Britain and its Empire. Ch 20. The late-Victorian and war economy. Ch 21. Intellectual ferment. Ch 22. People, society and culture. Ch 23. Political Change 1880-1901. Ch 24. Edwardian politics 1901-1914. Ch 25. The British road to war. Ch 26. The First World War. Part 6: War and the End of Empire 1919-1963. Ch 27. The economy in peace and war. Ch 28. Political change 1919-1939. Ch 29. The Second World War. Ch 30. People, society and culture. Callum G. Brown is professor of religious and cultural history at the University of Dundee. He is the author of eight books including Religion and Society in Twentieth-Century Britain (2006), Postmodernism for Historians (2004) and The Death of Christian Britain (2001). W. Hamish Fraser was professor of modern history at the University of Strathclyde. His publications include A History of British Trade Unionism 1700-1998 (1999) and The Coming of the Mass Market (1981), and he has also edited volumes on the histories of Glasgow and Aberdeen.